As I work on improving my essay writing skills, I’ve attempted to expand my horizons and read a wide variety of authors, including those with whom I’m not familiar. I recently came across Lauret Savoy, who in her new book, Trace, offers us a different perspective of nature, the environment, geography and American history, including its evolving race relations. She focuses on how people and communities interact with nature, which shouldn’t be viewed as some pristine thing that white people enjoy every once in a while. Her writings dovetail with environmental justice, which is something I’ve been thinking about over the past few years. It refers to the “fair treatment and meaningful involvement of all people regardless of race, color, national origin, or income” (as the EPA defines it) with respect to environmental regulations and policies. In my opinion, people whose work or activism involves race, class, gender and other power relations often ignore environmental issues, while environmentalists are often white and operate in a vacuum as if those other divisions aren’t important. But environmental justice brings these issues together. It grew out of the civil rights movement when people of color realized they were often suffering silently while disproportionately affected by toxic waste sites, power plants, landfills, and other environmental hazards. In one of my first guest blog posts (outside of this blog), for the Union of Concerned Scientists a couple years ago, I argued that climate change is an environmental justice issue, as the people most harmed by rising sea levels, floods, extreme droughts and heatwaves are those who did the least to contribute to the problem. Savoy considers these kinds of issues as she weaves in environmental justice in her new book, referring to “people of color and the economically poor [who] live, and die, next to degraded environments.” She argues that the concept of “ecological footprint” should account for dispossessed people and people’s labor. In Trace, a slim yet powerful volume, Savoy invites us to accompany her as she traces through her travels, her past, and her family history, following the paths she and her predecessors have taken. She explores varied and uneven terrain through ever changing and troubled relations between race and the American landscape. The book is sort of a collection of interconnected essays, which fit together into a cohesive story. Each chapter searches a particular place, asks questions about its origins and names, and considers her and others’ experiences there. “The American landscape was in some ways the template, but also the trigger, to each of the searches,” she said in an interview about the book. Savoy is a professor of environmental studies and geology at Mount Holyoke College in Massachusetts. She identifies as a woman of African American, Euro-American, and Native American heritage. During her childhood, she lived in California and journeyed to Arizona, through Mexican borderlands, and across the continental divide, and she takes us through each of these places. Early in the book, she tells a story about how as a 7-year-old girl at a gift shop at the north rim of the Grand Canyon, she tried to purchase some postcards displaying photos of places she liked. But the woman behind the counter wouldn’t sell them to her, and she runs off into the woods. It’s one of her first experiences of racism. Throughout her work, Savoy advocates for a more diverse and nuanced view of nature and the environment, and she encourages us to remember that each place we visit has a complex history. I welcome and respect her voice. 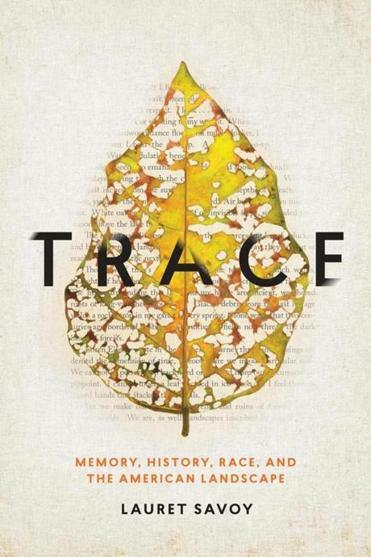 I found Trace to be fascinating and inspiring to read, and I think anyone who enjoys Leopold, Walt Whitman, Rachel Carson, Annie Dillard and Terry Tempest Williams would love this book too. Next time you go an a walk through your neighborhood park or on a road trip in the Southwest, bring it with you. ← Exciting and Controversial Science: Gravitational Waves and a New Ninth Planet?